Super Savings Item! Free Shipping Included! 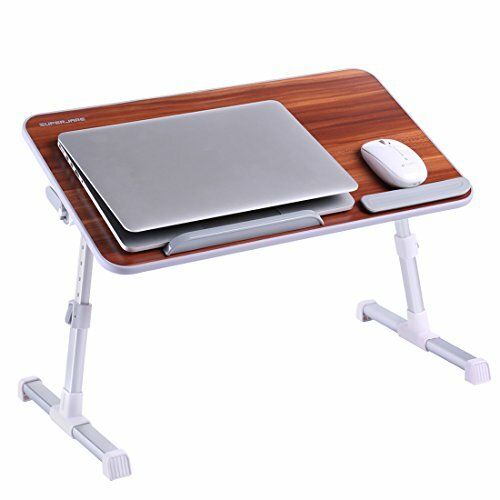 Save 34% on the Portable Laptop Table by Superjare | Foldable & Durable Design Stand Desk | Adjustable Angle & Height for Bed Couch Floor | Notebook Holder | Breakfast Tray - American Cherry by SUPERJARE at The Daily Codex. MPN: B01N7MWJ4H. Hurry! Limited time offer. Offer valid only while supplies last. Probably you want to know: Q: Is it good to keep balance while you set it on a couch or chair? A: Yes, most couch or chairs work, but some may not. Q: Is it good to keep balance while you set it on a couch or chair? A: Yes, most couch or chairs work, but some may not. It depends on how flat or hard the surface of your couch or chair is, if the surface is too soft, the table might wobble while works. Q: What's the laptop desk made of ? A: It is made of quality aluminum alloy, and MDF board. Q: How to adjust the height and angle? A: With one auto-lock button on each side you can easily adjust the height (Adjustable from 9.4" - 12.6"). Two switches could be used to adjust the tabletop angle (from 0-36°). Q: How wide are the widest parts between the legs? Q: What's the folded size and the weight of the laptop desk? A: The folded size is 20.5" x 11.8", Weight: 3.3 lbs. Q: What size of laptop suitable for? A: Perfectly fits up to 15" laptop with a mouse space. Q: Is there a larger table to fit 17" or larger laptop? Q: Can the stoppers holding the laptop or mouse be take off? A: Yes, you can remove it when not in use. Note: The two stoppers couldn't switch positions. Q: Does it set up for a right handed person? A: Yes, it works well for right-handed users, not works for left handed users. Q: What is the max. load for this laptop desk? A: Up to 66 lbs (30 kg). Q: Is the table easy to assemble? A: Yes, no assembly required. You just need to put the stoppers on, which come in the package and are removable. Q: What should we know about the "crack" on the table edge? A: Please kindly know that it's not a crack, just an interface of the seal stripe, which is made of PE. It is normal, not a quality problem. CHEER UP YOUR WORK WITH A MULTIFUNCTIONAL TABLE: This table is ideal for reading, surfing the internet, or teleworking, especially if you're recovering from a medical condition and you need a bed table to work from. Plus, the overall weight of the table is 3.3 lbs. ENJOY ITS VERSATILITY AND CONVENIENCE: Heavy books are kept from slipping with the help of a stopper, and adjusting both tray height and tilt is a breeze. Fits a 15" laptop and mouse without any problems and the locking mechanisms hold well. (NOTE: Works well for right-handed user). A GREAT OPTION FOR A STAND-UP DESK: Our table is just what you were looking for at work! You can use this adjustable laptop desk on a regular height desk in case you want to work standing up. Forget about persistent backaches, neck stiffness and wrist fatigue. You'll be very happy with your purchase. OUTSTANDING OVERALL QUALITY: The build quality of our table is outstanding and it is really well designed. It's also easy for storage as the legs do fold up, a relatively small footprint, so it is quite portable. The locking mechanism also works really well for deploying the legs and, overall, it will certainly satisfy you! 24 MONTHS WARRANTY: We know you'll love our foldable table, but if for any reason you're not 100% satisfied, let us know and we'll do everything to help you. We offer you a 30-Day Money Back Guarantee and 24 months warranty for normal use. If you have any questions about this product by SUPERJARE, contact us by completing and submitting the form below. If you are looking for a specif part number, please include it with your message.